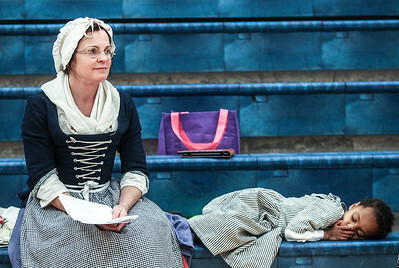 Sarah Nader- snader@shawmedia.com Marcia Flanagan (led) of Woodstock teaches Caitlyn Stelston, 15, of Crystal Lake how to fold a flag during an event hosted by the Kshwaukee Trail chapter of Daughters of the American Revolution at Hannah Beardsley Middle School in Crystal Lake Saturday, February 22, 2014. Girl Scouts learned about historical flags, flag etiquette, conducting a flag ceremony and the history of the American flag during the event. Sarah Nader- snader@shawmedia.com Julie Mosher (left) of Crystal Lake sits next to her sleeping daughter, Tinsae, 4, while the Kshwaukee Trail chapter of Daughters of the American Revolution teach area Girl Scouts about historical flags, flag etiquette, conducting a flag ceremony and the history of the American flag at Hannah Beardsley Middle School in Crystal Lake Saturday, February 22, 2014. Sarah Nader- snader@shawmedia.com The Kshwaukee Trail chapter of Daughters of the American Revolution teaches area Girl Scouts about historical flags, flag etiquette, conducting a flag ceremony and the history of the American flag at Hannah Beardsley Middle School in Crystal Lake Saturday, February 22, 2014. 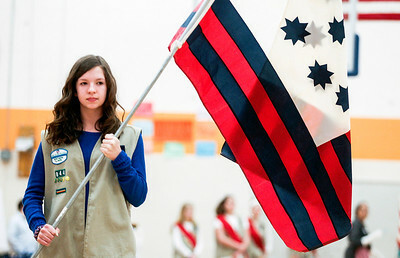 Sarah Nader- snader@shawmedia.com Julianne Amato, 13, of Crystal Lake carries a flag while attending an event for Girl Scouts hosted by the Kshwaukee Trail chapter of Daughters of the American Revolution at Hannah Beardsley Middle School in Crystal Lake Saturday, February 22, 2014. 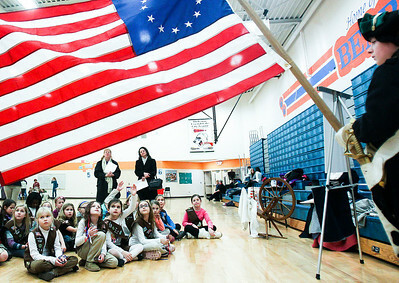 Girl Scouts learned about historical flags, flag etiquette, conducting a flag ceremony and the history of the American flag during the event. 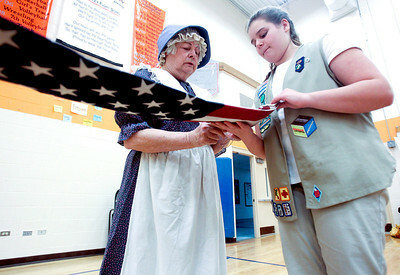 Julie Mosher (left) of Crystal Lake sits next to her sleeping daughter, Tinsae, 4, while the Kshwaukee Trail chapter of Daughters of the American Revolution teach area Girl Scouts about historical flags, flag etiquette, conducting a flag ceremony and the history of the American flag at Hannah Beardsley Middle School in Crystal Lake Saturday, February 22, 2014.